Everyone needs a few banana recipes in their collection. This snack cake is a perfect after school snack for kids coming home with great big appetites. Because is it just my kids that come home wanting more of a meal than a snack after school? They take a snack (or two, in my son’s case) and a lunch to school and yet when they get home around 4:00 it is like my children have been replaced with little scavenger animals who have been deprived of food for quite some time. 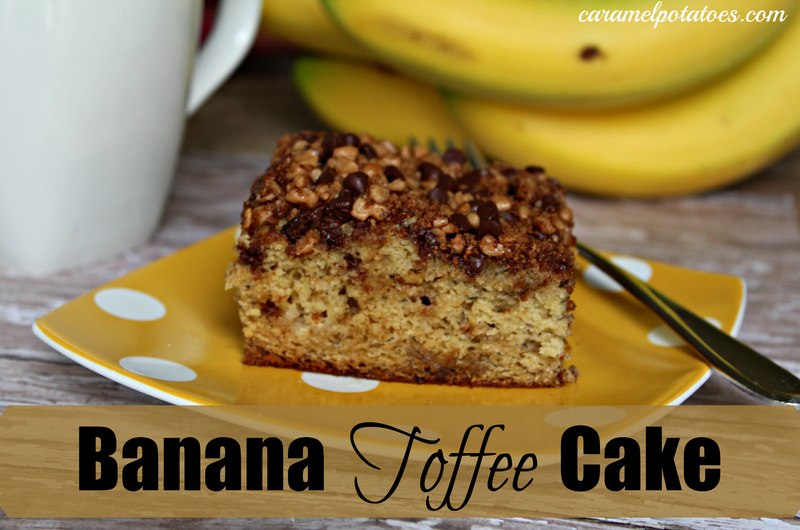 So, I am always on the lookout for great after school snacks and this Banana Toffee Cake fits the bill. Cream the cream cheese, butter, and sugars until light and fluffy. Add the eggs, banana, and vanilla and cream again. Sift together the salt, flour, baking powder, and baking soda. Slowly add the flour mixture to the creamed mixture. In a small bowl combine the toffee bits, chocolate chips, brown sugar, and cinnamon. Stir 1/2 c. of this into the batter. Spread the batter in a greased 9×13 pan. Top with the rest of the topping ingredients. Bake at 350 for 30-35 minutes.